A good friend of mine once made the comment that you don’t get rich running proficiency testing programs. He was correct. There have to be other reasons to get programs started and continued. For most organizations, the prime motivation is directly associated with a belief and commitment that laboratory testing can and must be the best that it can be for the benefit of patients, clinicians, and laboratorians. It is for a Commitment to Quality. I suspect that most laboratorians understand why they are required to participate in proficiency testing. That does not make it any easier to accept. In over 30 years I don’t recall many technologists or microbiologists telling me that they look forward to receiving and testing our challenge samples. But the important thing is that they do it anyways. As an aside, I will say that this is a good but not perfect question. While it is focused and specific, the preamble is too long. We provided a scale of 6 different answers that varied by degree. (See the enclosed figure). To increase participation and reliability we follow our rules that all surveys are anonymous and optional, with no required responses. And generally we accept the responses in the first 2 weeks. If we get a response rate of 20 percent or greater we don’t bother with additional prompts. The responses to the question were both enlightening and encouraging. More than seventy-five percent of laboratories reported back to us that when they get proficiency testing challenge errors they find that the investigation of that PT error leads to finding and amending system problems. Usually these were minor issues that were addressed with procedure tweaks, but sometimes the issues were significant. Only about 13 percent said that they found no reason to follow up a PT with a peak at their system to ensure that it was working properly. The balance (who responded with “other and a comment”) were all laboratories that had made some form of system follow-up. When “other and comment” were combined with the direct responders, almost 90 percent of laboratories reported that having a PT error lead to some form of larger investigation which lead to some level of system improvement. That is a very good finding, and shows that the crafters of laboratory Quality were right when they required laboratories to participate in proficiency testing because error improvement contributes to better patient and customer care. Many laboratories continue to overwork PT samples, because they view PT as a test rather than as a Quality measure. But overworking samples can hide or minimize system errors. Some of those that noted changes that needed small tweaks only may have missed opportunities to discover and correct larger issues. It appears there are a small number of laboratories that may need some help in seeing the value of error detection and aware through PT. While errors can be PT specific, it is more likely, if the laboratories used their routine procedures that PT errors may have their foundation in the laboratory’s normal structure and function, and that taking a look may be worthwhile. These are fully lost opportunities. So to me there is a bottom line. 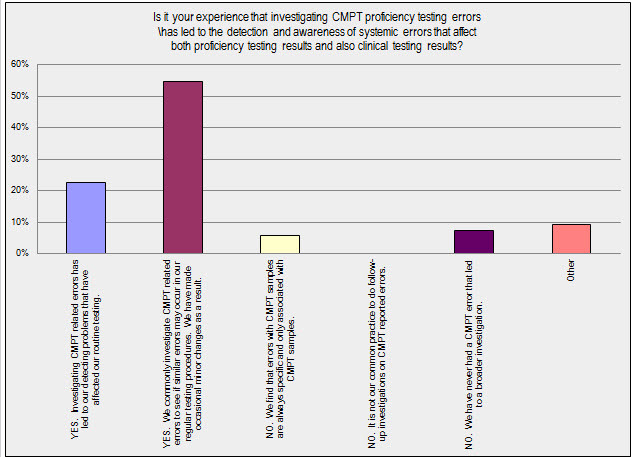 This survey provides supportive evidence that participation in proficiency testing aids Laboratory Quality Management. That is good for laboratories and their clients and is the best reason for us to continue providing medical laboratory proficiency testing programs.